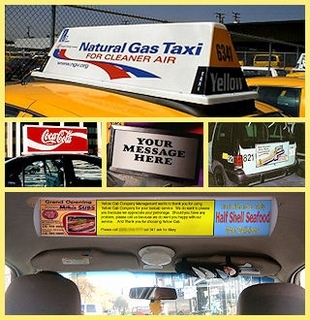 Ad Carrier Signs for Taxis, Livery and Delivery Vehicles. Roof-Top, Trunk and Inside Styles Available. Let your Signs identify your vehicles AND make money for you. Restaurants, pizza parlors, nightclubs and other businesses that regularly attract patrons by taxi love to have their message displayed on top of the car that picks up potential customers, and they'll pay you handsomely to carry that message for them. Put your signs to work for you. See the styles available below. Please contact us with your needs and for pricing & delivery. Time tested and proven by 35 years of actual use on Taxicabs throughout the world for maximum Advertising Impact and requiring little maintenance. 54"L X 17"W x 16"H heavy polycarbonate one piece shell with aluminum pan. Available in frosted white top that can be painted. 39"L X 14"W x 15"H heavy polycarbonate one piece shell with aluminum pan. Available in frosted white top that can be painted. 37.25" L X 42" W x 15.5" H triangular ad carrier with 3 signs so one is always visible. Translucent media can be back lighted for night advertosing. 31.25" L x 36" W x 14.25" H triangular ad carrier with 3 signs so one is always visible. Translucent media can be back lighted for night advertosing. Livery Van Rear Ad Carrier with 16-1/2"H x 35-3/4"L poster. Hinged cover allows easy ad exchange. Auto Sized Illuminated Interior Ad Carrier with 4"H x 24"L poster. Back lighted for translucent media. Van Sized Illuminated Interior Ad Carrier with 4"H x 28"L poster. Back lighted for translucent media.